Happy Halloween! We faced the scariest thing imaginable for a bad books podcast: a video game tie-in novel that turned out to be actually like, really good? We know: we were shocked too. Almost as shocked as the teen protagonists of Five Nights at Freddy’s: The Silver Eyes by Kira Breed-Wrisley and Scott Cawthon were to discover all the horrors awaiting them at Freddy Fazbear’s Funtime Pizza. Rebecca Mahoney of The Bridge podcast joined us for one night of terror. Do not listen to this podcast on your overnight security guard shift: you need to keep your senses alert! 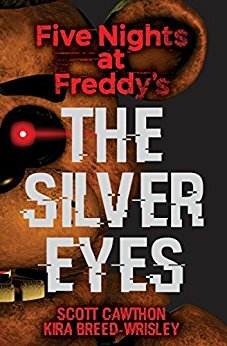 Content warning: This book and our discussion of it contains the death of a child, suicide, and some very scary animatronics. Candy Pairing: Kait says fruit flavored Tootsie rolls, Rebecca says Pop Rocks, Renata says birthday cake. Coming up next: Red Rising by Pierce Brown.